You can help out the Assembly after you're gone by including the FNCA in your will. Over the years, we have received real estate, stocks and bonds, and money. In fact, it was with money bequeathed to the Assembly that we added both our newest building: Adrienne Frank Fellowship Hall, and one of our oldest: the Taft Cabin. Frank Hall is a one-room gathering hall, with a screened-in porch along one entire side. 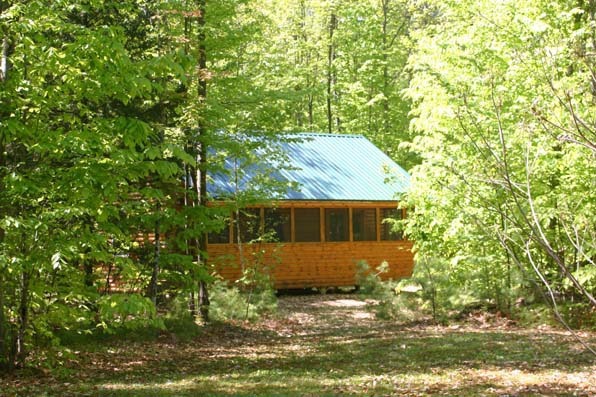 Nestled in a secluded spot in the woods, it is used for a wide variety of camp activities, including: early morning yoga, children and teen religion classes during the day, adult socials in the evening, the Opening Weekend Program, as well as meetings and informal gatherings of all sorts. © Beki Greenwood 2008 © Jon Cousins 2013The Taft Cabin was built in 1948 and has been providing shelter and warmth for families and couples for 60+ years and still going strong. 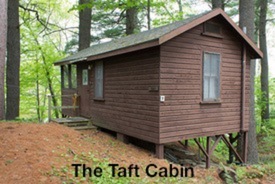 "The Taft Legacy", a charitable gift from Mr. & Mrs. Charles Taft, financed this cabin overlooking the Saco River, as well as numerous other Assembly projects over many, many years. Your support of the FNCA right now can provide help for untold future generations to come. We encourage both earmarked and open bequeathals. For details, please contact FNCA treasurer Bob Perry at rperry@fryeburg.org.